Prototype: Class G 2000 BB Vossloh heavy diesel locomotive with symmetrical cabs, painted and lettered for Railion Italia Services S.r.l. "Traffic Red" basic paint scheme with a "Basalt Gray" frame. Road number G 2000-03 SF. The locomotive looks as it did around 2006. Model: The locomotive has a digital decoder and extensive sound and light functions. It also has controlled high-efficiency propulsion with a flywheel, centrally mounted. All 4 axles powered by means of cardan shafts. Traction tires. The triple headlights and dual red marker lights change over with the direction of travel, will work in conventional operation, and can be controlled digitally. The headlights at Locomotive Ends 2 and 1 can be turned off separately in digital operation. When the headlights are off at both ends, the double "A" lights are on at both ends. The cabs have lighting and it can be controlled separately at both ends in digital operation. Maintenance-free warm white and red LEDs are used for the lighting. The locomotive has many separately applied details. The side handrails on the frame are constructed of metal. The locomotive has detailed buffer beams. Brake hoses that can be mounted on the end of the locomotive are included. End covers are included and can be mounted on the buffer beam. Length over the buffers 20 cm / 7-7/8". Highlights: Frame and parts of the body constructed of metal. Cab lighting can be controlled separately in digital operation. Digital decoder and extensive operating and sound functions included. The G 2000 Diesel Locomotive The class G 2000 BB diesel hydraulic locomotive is viewed at Vossloh Locomotives GmbH (formerly MaK) in Kiel as the most powerful unit of its kind. It was presented in its original version for the first time in September of 2000 at the Innotrans Exhibition in Berlin, Germany. The first thing to strike the observer was the narrow superstructure with side catwalks and the asymmetrical cabs at the ends. Both ends seen in the direction of travel showed the cab at the front of the locomotive stretching to the left across the complete width of the locomotive. To the right the cab ended even with the narrow superstructure. Next to, it at both ends was a switching step that was marvelously suited for operations with radio remote control. With it, switching work occurring at the end of a run could be done with no problem and without a second locomotive. Special features of the G 2000 BB are a fully developed building block design principle, the selection of high quality components, as well as a high level of reliability and availability. In addition to the original version, the G 2000 BB was also built between 2003 and 2010 with a cab across the entire width of the locomotive. This enabled a considerably more spacious cab with two seats and equally good sight down the track. The first units as the G 2000-2 BB went to different private transportation firms in Italy, the G 2000-3 BB variant to France, Belgium, the Netherlands, and Germany. Even the Belgian State Railroad (SNCB) has several units on its roster as leased locomotives. At its introduction to the market, the G 2000 set new standards for diesel road engines regarding design, functionality, and life cycle costs (LCC). It has an output of up to 2,700 kilowatts / 3,621 horsepower, a maximum speed of 120 km/h / 75 mph, 5,000 liters / 1,321 gallons tank capacity, and a service weight of 87 to 90 metric tons. This unit can be used almost everywhere. 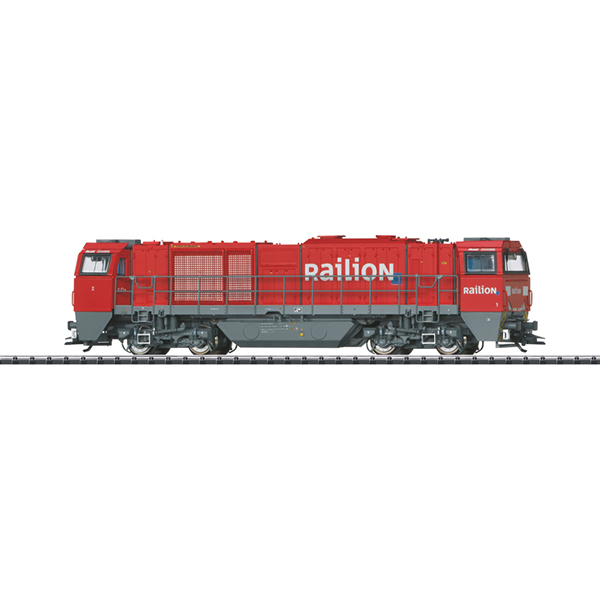 An AC model of this locomotive can be found in the Marklin H0 assortment under item number 37200.